When I came up after first seeing the bug I said that the bug was one of the largest I had ever seen if not the largest. Bill Magee then asked if it had eyes the size of golf balls. This was in reference to a different story regarding Capt. Mike Roach and a halibut he had seen. Anyway, the lobster I had seen was a case of "greener grass" as I have seen and captured many lobsters at the 9 1/2 pound mark and above. Shel came up to the boat and said that there was this huge bug, but it was back in a hole too small for him to get to. I was smaller than him so he wanted me to work in and get the bug. Shel, Seamus Callaghan, I and another diver went into a small cave at about 35 feet. At its back was a small hole going further in. There was a nice sized bug way back in it. I got my tank off and went in, but just couldn't get far enough back. We all went up again for what was our third strategy meet and I said I thought I could get it if I took off my weight belt. Joe was in the tunnel with no weight belt and has tank between his legs with one arm in front and one arm at his side, Shel was right behind him with my tank between his legs because mine also had a 10' second stage hose, and I was behind Shel with Shel's tank in the side of the tunnel. Shamus was outside wandering around like a vulture waiting to see what we might kick up. We all went back down in the cave and I got off my tank and weights. Unfortunately, I didn't have much air left. This time I could get in further and was working towards the bug. I figured no matter how far I got in, the other divers would eventually pull me out. I got in a further and then I had to turn my head sideways and that let me make it a bit further, but about this time, I got a squeeze on my leg that meant low air. I kicked them off and worked just a bit more in with both hands over my head. It was totally black at that point, but I got two hands on the bug and started kicking my feet together. Shel and the other divers pulled me back, hand over hand. It was 9 1/2 pounds. That's Joe and Shel on the ends. 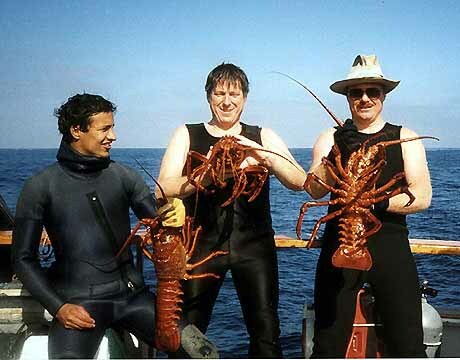 Lobster hunting is a wild and fantastically challenging sport. For some divers, it is a way of life. Shel and Joe are some great lobster hunters. Shel may well be the best of the lobster hunters in the 90's (as Wayno probably was in the 80's) and now in this decade as well. This may or may not be important to you, but the people that know Shel and call themselves lobster hunters, respect him a lot. What makes 'the best lobster hunter'. It's not necessarily the most taken. It is devotion to the sport and consistency at getting the big bugs. There is no one more devoted and no one that can more consistently pull the big bugs. A lot of people get bugs, but few even see 10 pound bugs. Shel gets them regularly. Then when it's all done, he lets the big ones go. Anything over 8 pounds he releases, because he believes that these are the most important breeders. And if he didn't get the big one that day, he will trade his smaller lobsters for the big one on the boat and then he'll release it. Even without that, he'd be a guy with some class, but that just shows a bit more. And Joe, well, there are a lot of people that wish they could do near as well as him.